See that food? 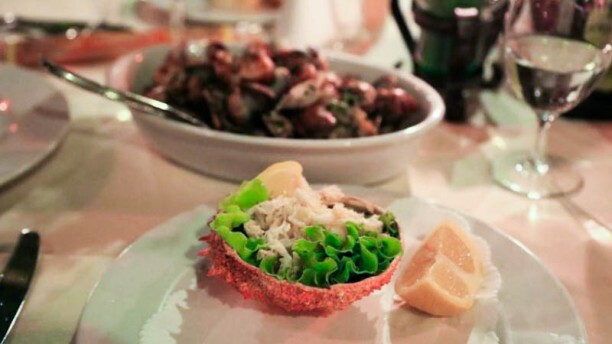 That is why the little Italian taverna with the elegant wooden tables and totally fresh seafood is a huge hit with locals and the lucky tourists that find the rustic treasure everyday and everynight. 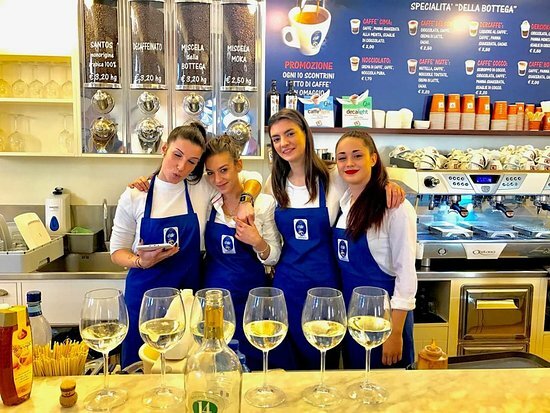 And the other reason is the young team of about 10 young waiters, all friends, age 27 to 34, who twirl around the tables laughing and joking constantly and hurriedly piling the great seafood on the tables, along with that lovely Spritz or one of 15 glasses of red or white wine. "You see it in low season, usually in the little space of only about 25 seats inside we have 125 people packed inside and outside. 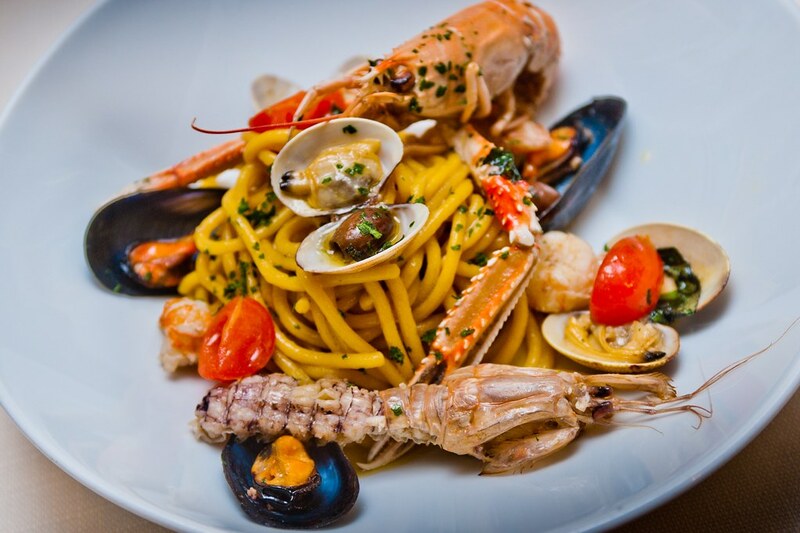 They love the food which is from my father's experience of 20 plus years in the Venecian industry where the fishermen and the people at the Mercato give him the best. That is respect." says Andrea, of which he is one of the two "nephews" although he is actually the cousin of the nephew Matteo, and Silvio's son! "See the picture above? I don't know why my mom chose the black and tan colors of the wine bottles." says Matteo and I say that is symbolic for red and white wine. "Hmm," he says looking at it again. We had three interviews total and the first was only Matteo, who you will not be able to keep a straight face with, he is that funny. And the team? Super friendly. Everytime I enter the trattoria they all say "HI" and wave as if friends! "See the plates? Everyone is special. Each one is different and unique. We set the table with colors. People feel as if they are in a fishing village and that is how fresh the fish is! Right off the boat!" laughs Matteo. "One evening, a French guest who comes here every year for 2 weeks on vacation and eats at the restaurant everyday, decided to draw with the black cuttlefish ink on his plate when he is finished. ...do I mention maybe that the fish is specialty here! 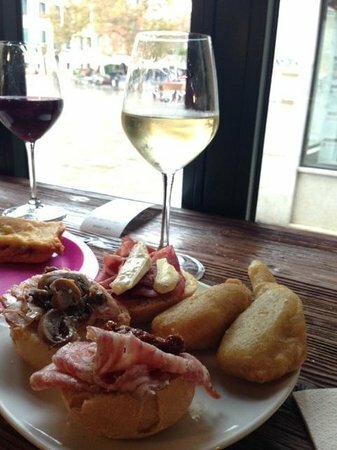 "Every year we have guests from America, France, China, Canada, they come and they always try us the first night at Venecia, and every night they come to try the lagoon specialities. That is the why I am happy because they come back every night. It is a tiny restaurant and a intimate one especially at night. We are the nicest and friendliest team here. Including Italian students who come and work with me. 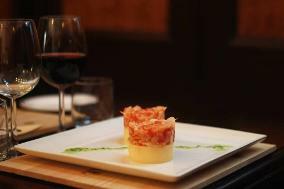 The guests love the food, the team and the atmosphere." says Enrico. I ask if that beautiful music I hear playing in the background is Italian opera? Enrico laughs, "No! It is Puerto Rican since my mom is from Puerto Rico and I have dual citizenship. I love the culture of Puerto Rico and in a couple of years I am opening my own restuarant of only Puerto Rican food. " he says proudly. ..."we specialize in fish and meat, the freshest every day and if it is fresh it is on the menu, and I can say that we have Tuna Tartar usually, yet again, it must be fresh from the Mercato. Same with the Tiramisu. It spoils after one day and you must have fresh made everyday. 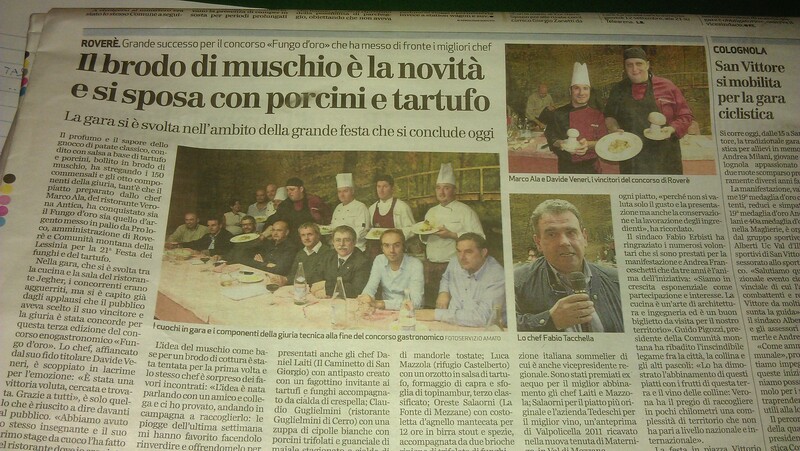 I know that in the last 5 years that I have been the Capo, my guests come everyday here to try new specialties." says the honestly very charming Enrico. (I met Enrico 3 years since in Venecia and his restuarant has been on every year). As we talk about the restaurant, Luca shows me the gardens and I notice the grapes growing on the vines. "Yes we have the little vineyard above the guests, and another little one in the corner, one is red sweet wine and one is white sweet wine. They are dessert wines, of course, and you can only sip these since they are very sweet, yet they are quite good." he says. Later I remind myself to eat a piece of the Zuppa Inglese, which he insists, "The dessert is Italian and the recipe is original Italian." and try the wine. A REAL Doge experience. "I have carried on my father's dream here the 3 years, since my father passed away. I mostly love making pizzas, I know, yet it is my specialty and I am only 27 years old, yet it is fun. You must try, you ask for anything to add to the pizza and I do it!" says the very charming and funny young Capo of Vesuvio. 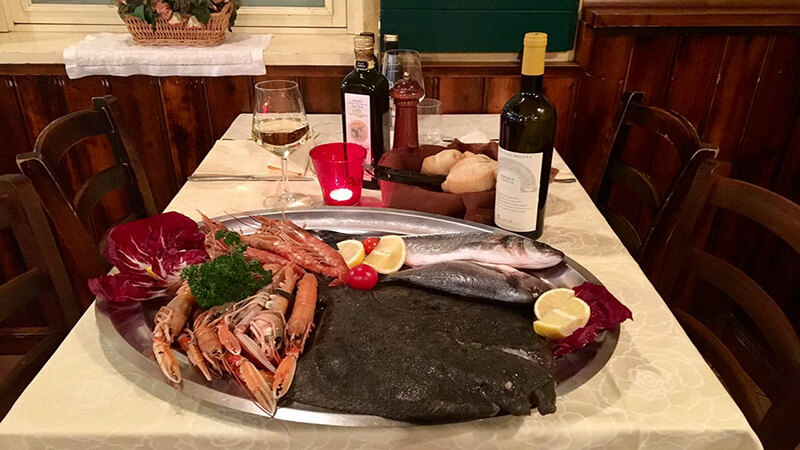 "You know here you can have a lovely Venecian traditional lunch and dinner and spend maybe 25.00 euros to 30.00 euros for the highest quality fish and pizza with the highest quality ingredients from the Rialto Mercato here in Venecia. I want my guests to know that the Venetian people come here to eat. We don't have high tourist prices . We have real quality and great meals. Have a couple bottles of wine with us if you insist on spending 60.00 euros per person, " jokes the young Capo and Max his translator! "...and when you come you can either say hi to Mario the one you see here or Enzo the Cuoco in the kitchen!. 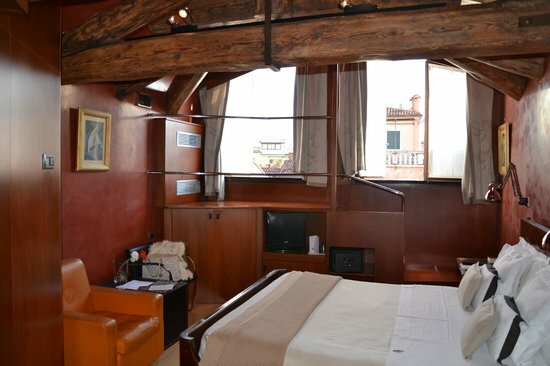 We're located at Cannaregio 1837, which is a tiny walk from the Train Station and in between the Jewish Quarter. The best of both worlds! Call us for reservations at Call 041 795 688 2" they say! Guido, the affable, intelligent and serious Capo of Ristorante Da Mario Alla Fava, and I had a chat today, "I started at the restaurant at hte age of 13 and came here every time school is out. My father managed the restaurant back in the 1960s, and I loved it. 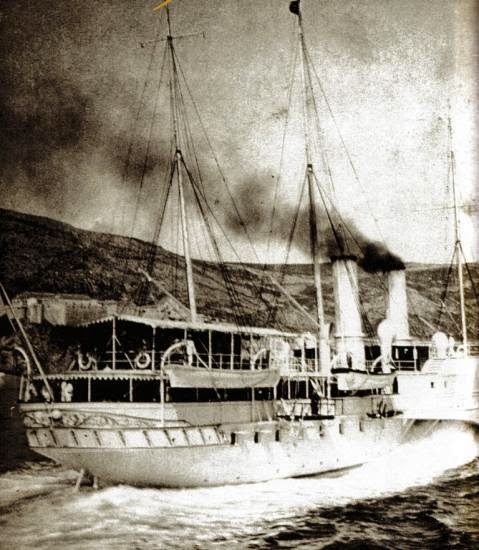 I loved the people, the service and the tourists were very different back then. The people that came you can see on portrayed on the walls. Movie Stars, Important politicians, fancy tourists. They spent and spent. They talked about important things happening in the world. 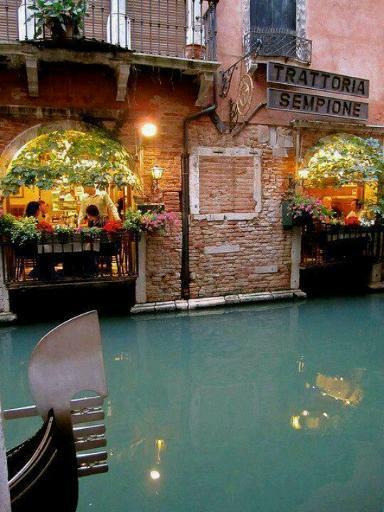 Today if the tourists come to Venecia to my restuarant they must represent that in life. The food is highest quality, and yes we've been on Michelin which I value more than Trip Advisor. The guide is about a physical person sitting down to dinner and telling me the way it is. Very respected guide." he says. 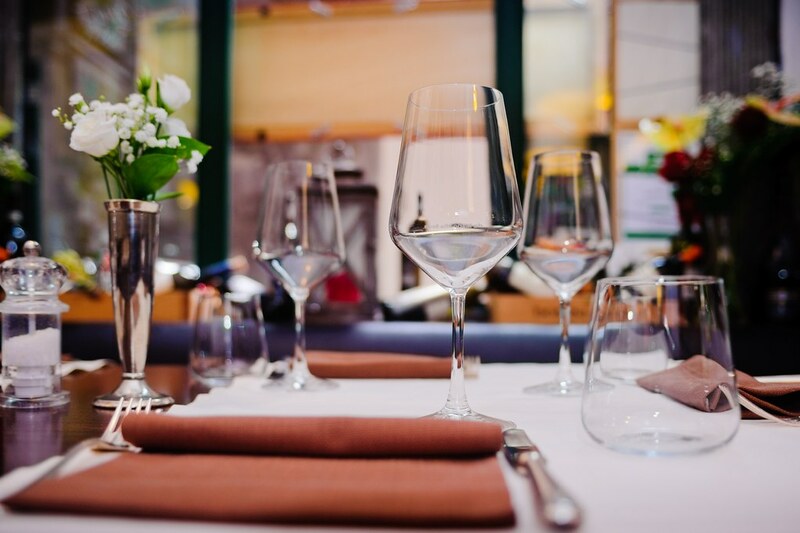 "If you come to the restaurant it is about maybe in the higher range of dining, yet it is the finest quality, my team has been with me at least 13 to 17 years and the chef too. We talk about the service and we talk about the menu. 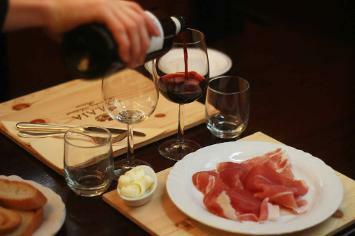 We give personal one on one service to the guest and I suggest the wine, which is the majority from Italy. It is definitely a Old-School Restaurant in terms of service and clientale and I guess conversation. The menu is traditional yet modern as we watch, we see, we understand the modern moment that people need today. If you want a cheap dinner go somewhere else and if you don't value dressing a little up for dinner to have a special day maybe ours isn't for you. I am not saying that you must where jackets, yet don't come in shorts and barefeet. Remember the Golden days of a special dinner and a special respected vacation and you will feel comfortable at my restaurant." says Guido, who along with his brother Luca run the 1960 seafood restaurant. 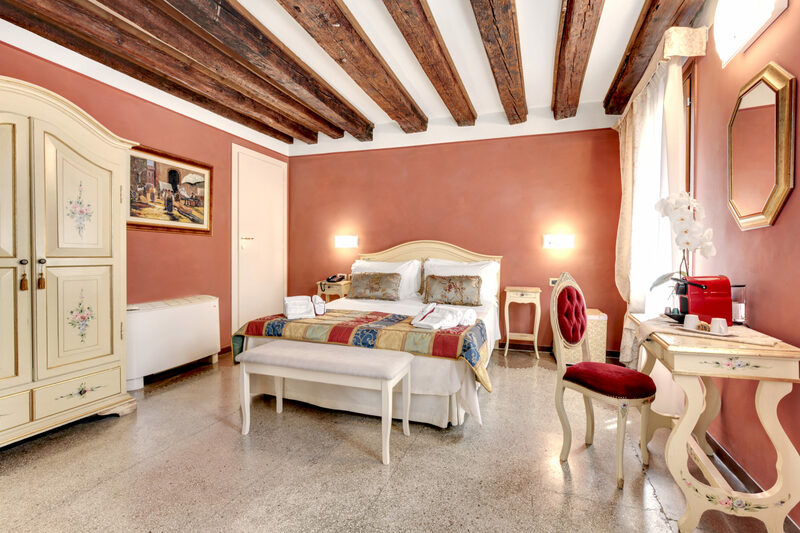 The many faces of Saturnia, the 4star family owned and run hotel since 1908 in Venice, just steps from San Mark's square, is a juxtaposition of elegance, warmth, sophistication (with its Michelin rated restaurant) and comfort. The rooms are beautiful with a typical 19th century design. You can actually see your Gondola pull up to pick you up at the side canal if you happen to be staring out the window! I loved my visit here and the breakfast is amazing to say the least with the All-Star chefs of the kitchen creating it. I always stay way too long and love the night hours of the first floor lobby hidden from the front. It has a grand piano and cumfy leather couches and worn oriental carpets and tons of old-fashioned books to browse through. They could actually put a couple more rooms here if they wished, yet I am happy the entire 1st floor square is reserved for guests to sit and relax in the quiet hours of the night. 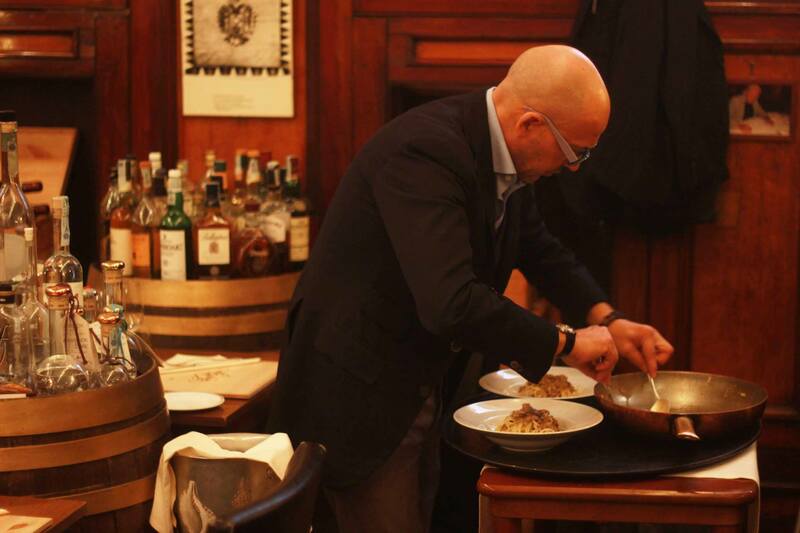 "I've always loved the bar attached to the Saturnia, Il Caravellino, and after my uncle's retirement I started managing it in a completely different manner, giving it a new style and now I use my expertise in promoting it. 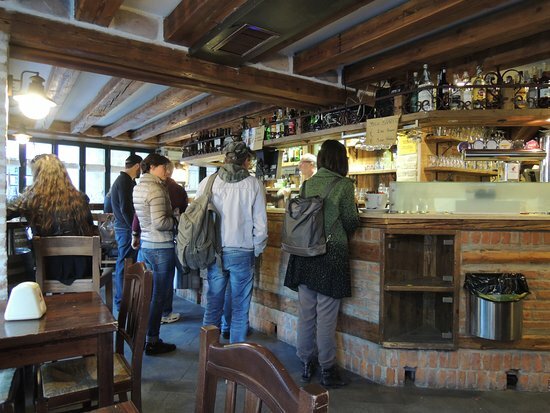 The bar is elegant and the people love it, yet for many years it had much privacy and was too stuffy. 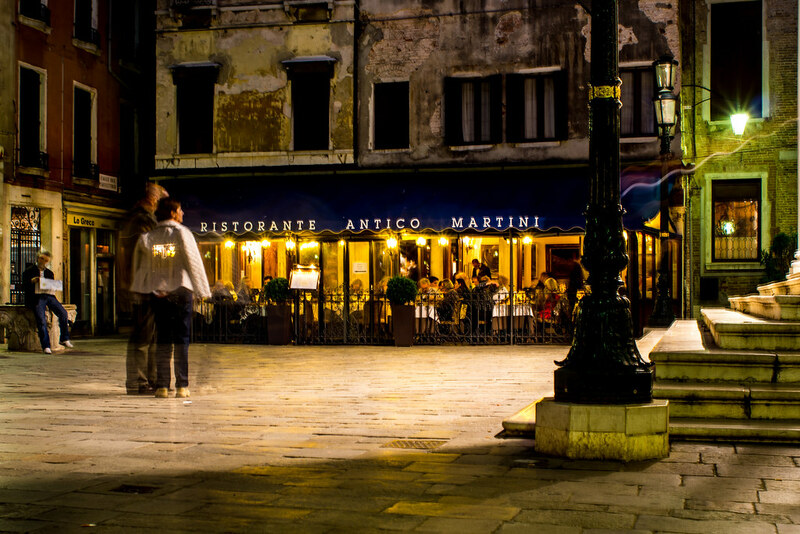 Now it is chic and trendy and we have among the best of the cocktails of Venice." says Gianni, the young son who is the 4th generation of the Serandrei famous family that has owned the 4star Superior since 1908. 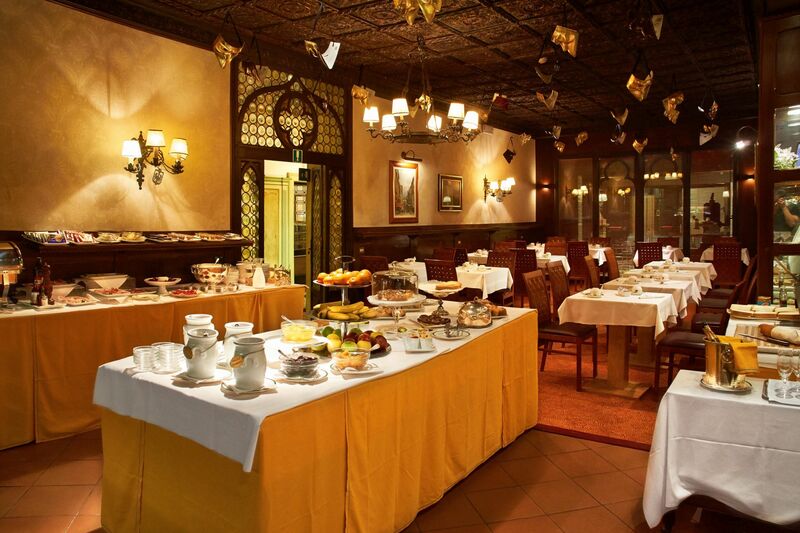 "My father's great grandfather opened the hotel in 1908 with only 10 rooms and then during the century he grew up!" he laughs. "Now it has 87 rooms, yet I am renovating one of the best views room that forever had been the maintenance room! Yes, it is true, I entered into the maintenance room and said, Hey why does the maintenance room have the best view on the canal!" he jokes!
" 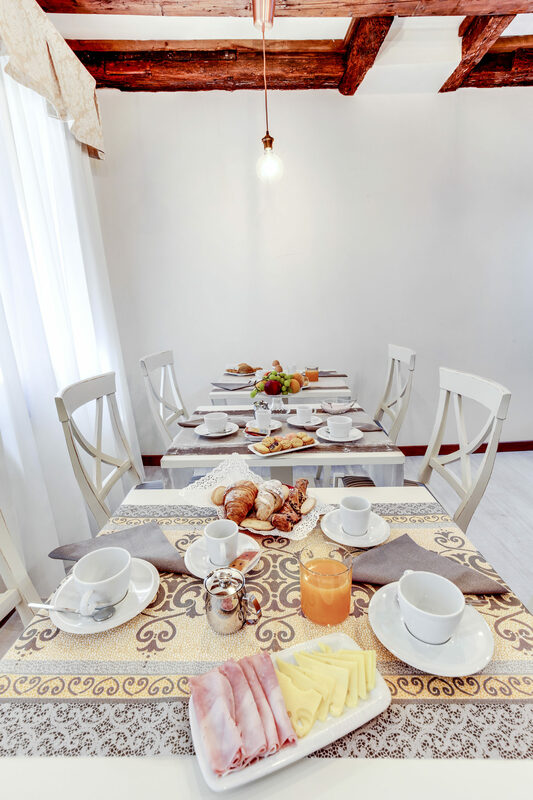 "And the guests who come here appreciate the beauty of course and the elegance, yet I believe they love the family atmosphere.We are one of the last family run 4stars left in Venecia and you can definitely tell that it is a family. We're present always, the four siblings since my father passed away, and we are very friendly. That is the difference, I think of a family run hotel. That very personal feeling, you are not just a number in our hotel." 2 structures, the Ca' Pisani Hotel, that we opened in 2000 and here.He is in charge of the Ca' Pisani publicity and does such a great job that we never have any rooms! And My sister Marianna, is the one who you will find everyday at the Ca' Pisani. "My family and I opened the Ca' Pisani, the first Design Hotel in Venecia in the year 2000 and it has been crazy booked ever since. The modern design art deco concept has really attracted a huge crowd. We have the traditional Saturnia since 1908, and the Ca' Pisani is way different, yet it is 17th out of 400 hotels on Trip Advisor. People are crazy about the beauty. You definitely need to check it out and see that hotel." invites Gianni and I am definitely going to see the beauty of it. Gorgeous! 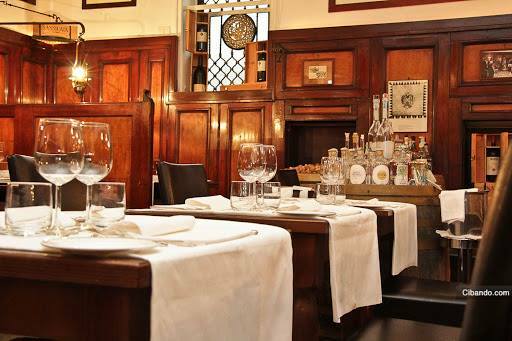 "The La Caravello has 8 chefs and 10 servers. It is a huge deal to present such service everyday and everynight. The food is Michelin quality, of course, yet the service has to be as high quality as the food. It is with great pleasure that I now can do as I wish to open up the La Caravella and Il Caravellino Bar to let their guests enjoy dinner." says Gianni. 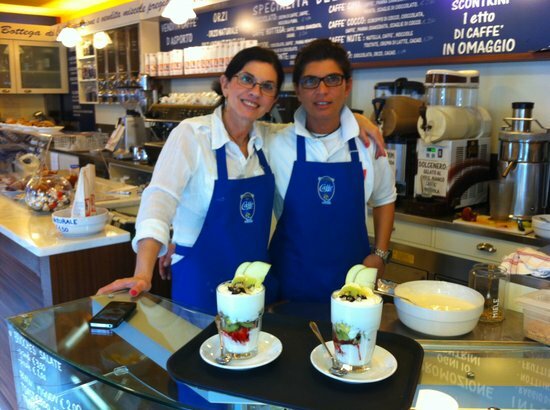 His sister, Marianna is the one who runs the Ca'Pisani which has won awards for its unique designs..
"I love people. I love talking to people and mingling with the guests. Every week we host a happy hour here in the restaurant and I personally show up and mingle with the guests, except for the fact that during the International Film festival it might be difficult since I love to see the films on the island of Lido, too!" jokes Marianna. "Yet, when I come to the happy hour, the guests are all excited to see the one who owns Ca'Pisani. And since I love to travel and I love to collect something from the travels, such as a intrigueing necklace that represents that culture, it gives me something to help with the conversations. The guests always say, O love that piece of jewelry and I can talk about my travelling in the culture which leads to the guests telling me about their favorite destinations, too. We learn from each other." she says. Interesting! ...the top of the roof deck on the 4th level at the Hotel Saturnia has many fun dances...always! 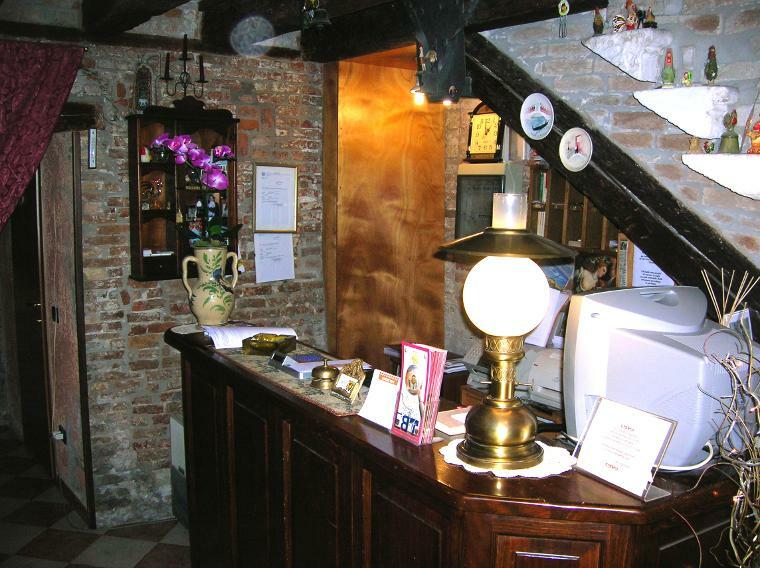 II Caravellino Bar Venice...located in the Hotel Saturnia. ...the coolest glasses ever, the Django Lu255, "I designed these myself amoung the first of my designs about 8 years now. Honestly, they are still on the online store and in the showrooms, since everybody loves that design. Every frame is hand made. Every one. The Django is the coolest because of it's lens, as you have seen. When you put the glasses on the face, the lens goes dark to the people looking at you, you're hidden essentially, yet you can see perfectly. They are almost 100% suv protection. People are always intrigued, excited and surprised when they try my lenses and glasses on." "Now with my mother as the chef the last 40 years I try to bring the restaurant into the modern taste of the young generation and walk with a type of future that is more sophisticated imprinting of the food that is a fusion of the Venetian tradition and the modern style. here it is fresh. We have preparation of the lagoon squid with the black ink in season that takes 48 hrs. of preparation, yet you can taste the freshness. Only here in Venice do we have that." 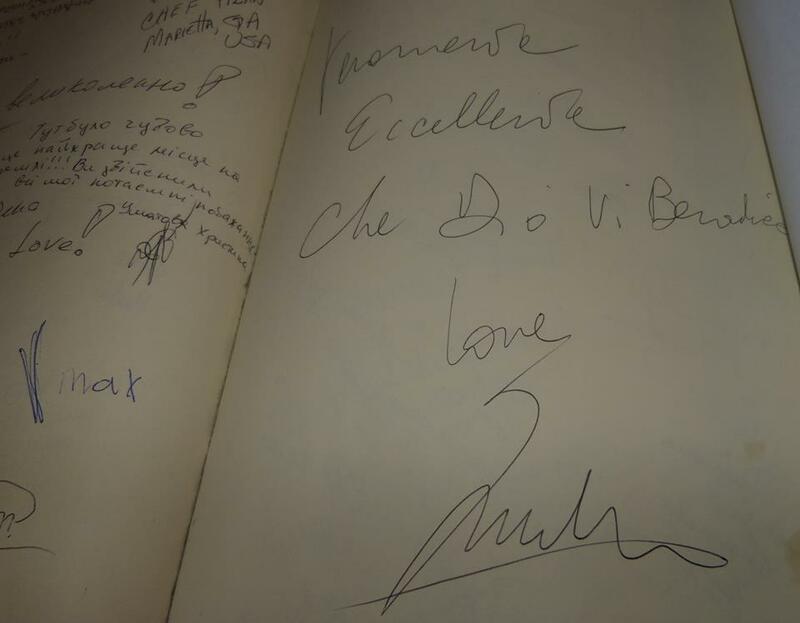 says Damiano, the young 40 year old son of the famous couple, Maurizio and Mara Martin. 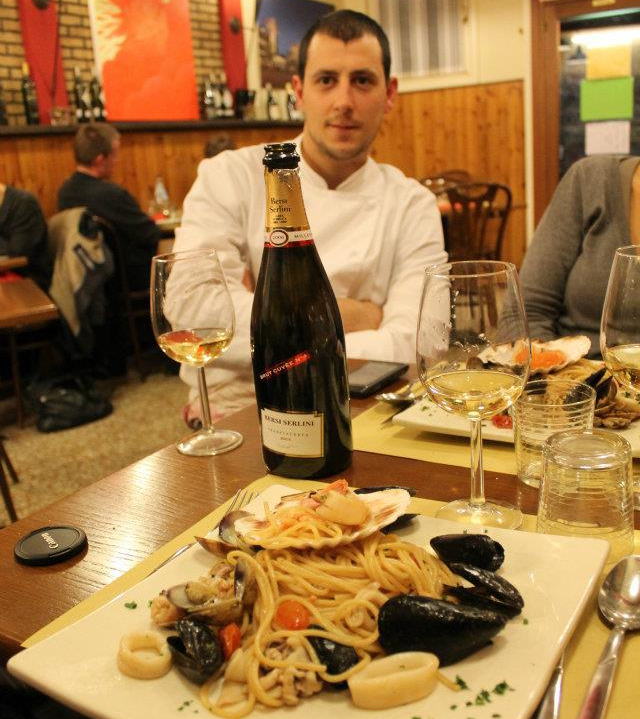 Above the young son, Damiano, at home with his guests in his restaurant, Ristorante Da Fiore. "I've traveled everywhere in the world and as a younger person lived 6 years in New York. I love the Americans as tourists and in New York and they have always been very friendly and nice to me." to adjust to the level of conversation that each guest wants. Some love to chat and some love the privacy. We have funny moments everyday since we're human yet I always want the guests to walk out the door happy and with a smile on their faces that they love life." of creative food yet each day different." he says. It is difficult to believe that the young couple you see here, the Capo, Maurizio and his 30 year Michelin star wife, Mara, have a son who is 40 years old...I had the fun pleasure of speaking with , Damiano Martin, about his legacy and his famous family's restaurant in Venecia. 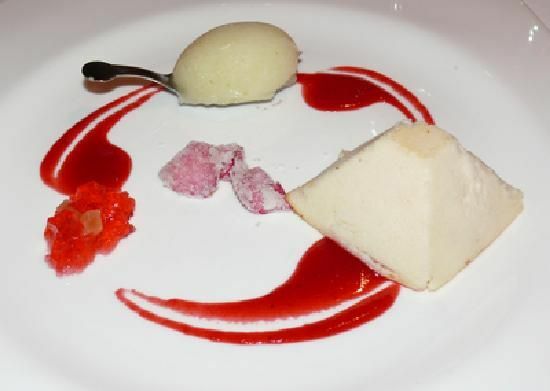 "It is the oldest Michelin star restaurant in Venice and has been awarded a star because of its food!" he says in his serious way. It is funny though because he says it in a way that implies not because of my friendliness, which by the way he is of the utmost professional when it comes to making his guests comfortable. "A couple people come here everyday the last 40 years...one comes to mind from Tuesdays to Fridays and the Venetians are very loyal. Yet we have our share of celebrities such as Anne Hathaway who was here last night and the star of Blacklist. They're both real nice people and of course everybody wants their autographs, yet we give everybody privacy and respect in the restaurant. Once they walk out...." he starts laughing when he says that. "You know people see stars and assume they are like their roles in real life, yet a real stern serious person on the movies could be the nicest person who smiles all the time in his personal life." 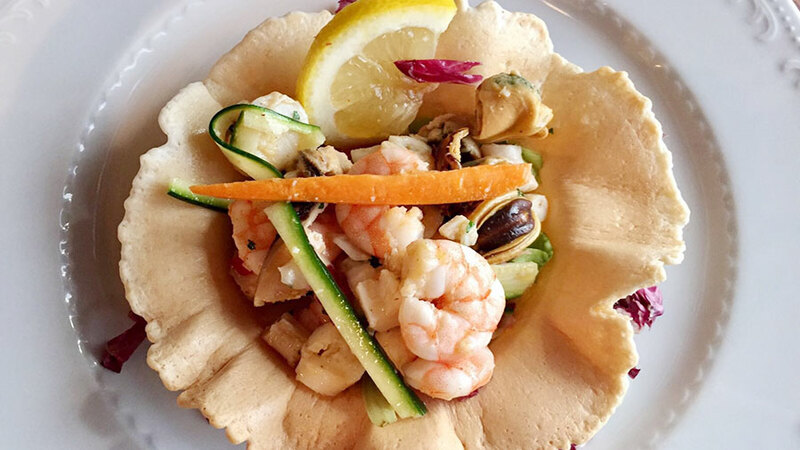 The Old World Charm of the Traditional Venetian Hosteria al Vecio Bragosso is mainly do to the two brothers, Carlos and Guiliano, who worked together til 17 years ago and one day said, "Let's open our own restaurant." 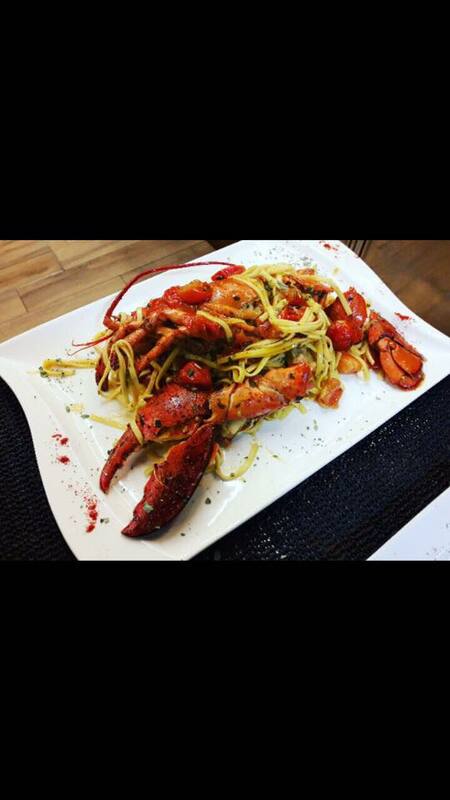 and the Creation is located at Strada Nuova 4386 Cannaregio. It is now in the 17th year of the brothers owning their own Hosteria. "Here is a organized respected tradition of the sea. 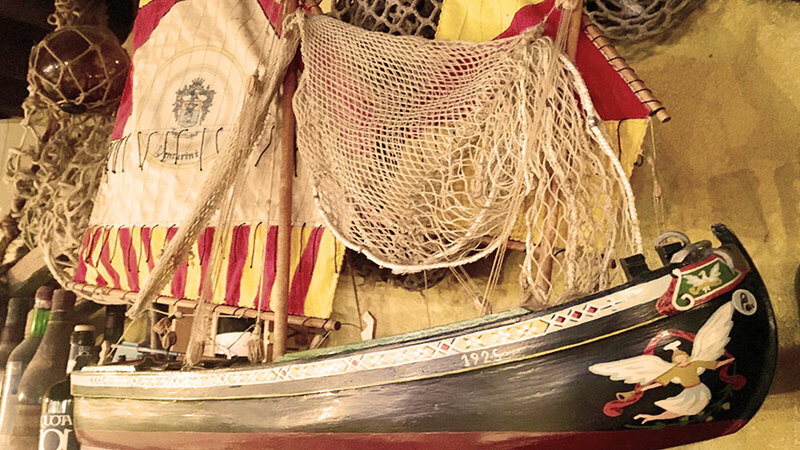 We strive to give the authentic feel of the olden times and you see that in the worn wooden tables and the pictures of the real fishermen on the walls. Me and my brother made that entire look ourselves. The entire restaurant is one of our creation and it is made to give a feel of warm affectionate emotions that you find in my home. When you come to my restaurant it is an honor to come to my home and feel that you are my guests. " says the very serious yet friendly Capo, Carlos. I tell him that he is a very serious commander and he laughs. "Yes, I want everything under control when we start and after I go to all the tables and I like to talk to the guests. I love my life. After the first 3 years of it being difficult to make a restaurant when I open the door in the morning I say that yes I love my life." he says. O I say it took 3 years to make it such a success? "The first 3 days it is a success!" he says laughing, yet I believe him as he had many friends and worked in the business in Venecia. "Venecia is a small city where everybody knows everybody. The fishermen we use in Chioggia all have been our friends for at least 17 years. Each night I send these great people messages or faxes as to want I would love to buy the next morning. Sometimes they have it sometimes they don't." he says. Carlos says, "The idea behind the restaurant is to make it as authentic as possible to the tradition of the Bragosso (and the peschereccio...the way of fishing)which is the old fishing boat that the real fishermen use. We (my brother Guiliano and me) come from a fishing village near Venice named Chioggia which is where we buy our fresh fish from almost everyday. 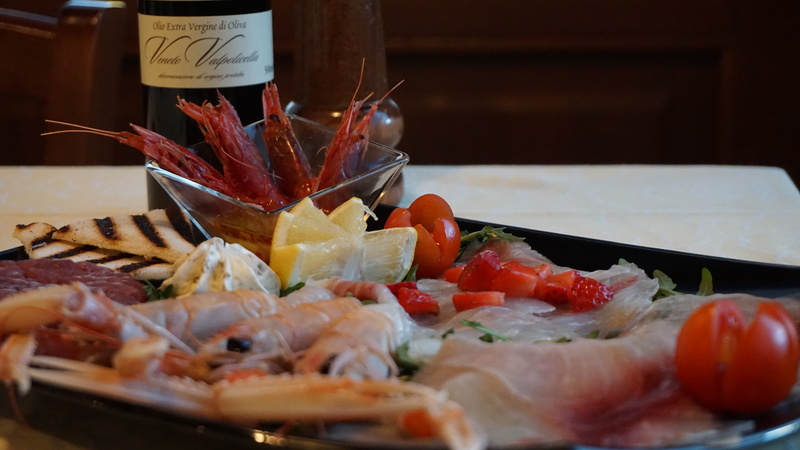 For instance although the Mercato is closed here in Venecia on Sundays and Mondays, at Chioggia we are able to buy the fish fresh since at Chioggia the Mercato is open." he says showing me a lovely plate of Sea Bass and cubes of Polenta(my favorite). "There is maybe 1,000 fishermen on their boats and we use a handful specially for us. Of course I can't fax one of my fishermen and say go catch a tuna! That is rare yet today we have 70kilo of tuna, and that means we can offer it in a variety of ways. We use what is the catch of the day. If they have it, if we want it, we buy it." he says as he explains the way of the fishermen! "The Al Vecio Bragosso means literally the old fisherman boat, such as the one here, " says Carlos as I ooo and aaa around the restaurant. I tell him that it reminds me of the Police Chief in the movie Jaws sitting at his house at night drinking wine surrounded by the Books of the Sea and the Fisherman memorablia on the walls. "I have never seen that movie, yet I want it to have that feel. Of a resort at the sea restaurant where families can come. 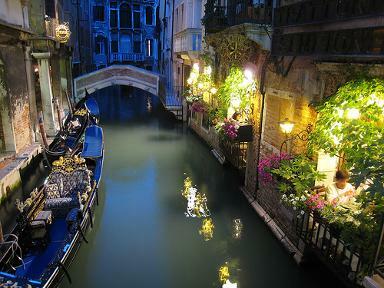 The idea of Venice is that it is a romantic city. A lovely place. 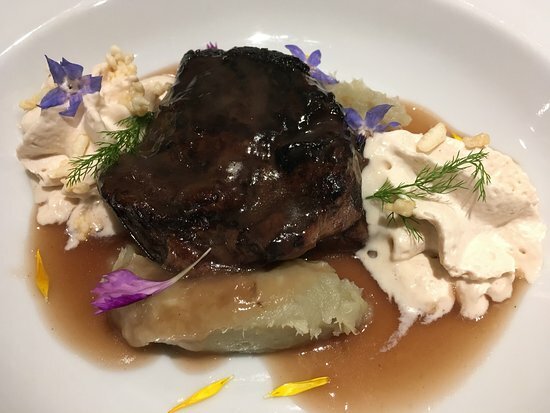 That is true, yet food is very important and we need to help the tourists have a super vacation with all the history and beauty of the city, yet a great lunch and a great dinner, too." he says. "I can speak for me and Guiliano when I say that we want a serious restaurant where the people want to come." Carlos says and I say that is a great quote...no other Capo has ever said that in quite that way. I love that Quote! I say. "It is true, though. The guests that come here have been coming for the last 17 years. They are guests that come every year and come from all around the world. If the tourists love the restaurant they come a couple of days on their vacation. You get to know them and they become friends. I can truly say that the fishermen that we do daily business with have become our friends and that the people that come here as Venetians every year for the 17 years are my friends. Guiliano's friends." 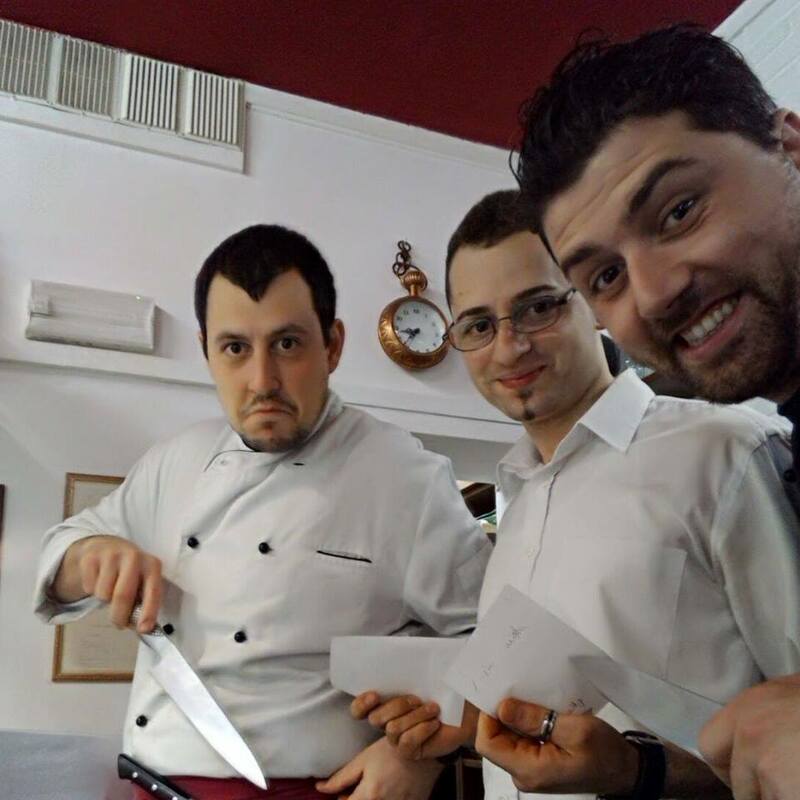 "We have fun here and I do have fun with my team, however the atmosphere of my restaurant is very important to me. The team knows that. I love the lights low. I love the intimate romantic feel and the beauty of the restaurant. The food is simple here. It is not the exotic best ingredients flown in from the Orient. It is the finest ingredients that I can find and the food that my kitchen makes is of the highest quality, which means that I have a select menu with simple dishes. My wine is from Italy only. My food is traditional Venetian. I have baked Gnocchis which you can find almost only here. Yet the team is kind, gentle and respectful to everybody. I hope that we give the best service and yet since it is my life I need to enjoy the evening. We do have fun"! he says. The Capo is a Commander of a Ship, his restaurant Rosa Rossa, where for the last almost 34 years he has been at the Captain's Chair, "Yes It is very important that it is the very favorite of Johnny Depp, since he came here during the filming of the Tourist in Venecia in 2010. The 5 star Hotel called us and said that they are sending very important guests coming here tonight...we said alright and at first in walked a huge body guard and we thought, hmm who is behind the body guard! My brother said O it is Johnny Depp! He had such fun with us and in the back intimate romantic room he stood on a chair and wrote his name on the ceiling! And he stayed 20 days in Venecia filming the tourist...and the amazing story is that everyday for the 20 days rather every night he either came in here to eat with us or he called his order in and the bodyguards came and brought the food to the Palace. He stayed and drank with us every night and one time til 7.00am. We had a lovely time with him. 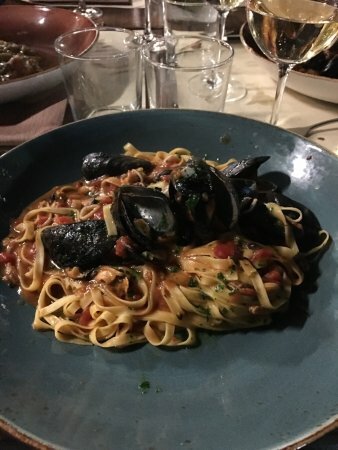 When people ask if the food is good I say ask Johnny Depp because of course they can't" jokes the funny Capo who is very self depreciating about his food saying, "I can't say that it is the best food in Venecia, we have simple food with high quality." he says. Francesca, who owns the cool chic restaurant and bar, SESTANTE, says "My mom owns the Hotel next door and I do the Rooftop Bar and the Terrazza Ristorante and my own super one the last 5 years that she asked if I am ready for my own and I said yes. It is open til Midnight and til 1.00am and has Cocktails just around the corner down the little alley from the Terrazze and I am most proud of it. 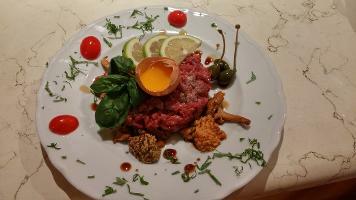 My specialty is fun, raw seafood that starts at 60.00euros per person, and great music and jazz that is live every 2 weeks. I hope you love it. I hope you come and hear great jazz. And I hope you come back and have a Oyster Martini that is my specialty" says the lovely and beautiful young woman Capo of the chic seafood bar. 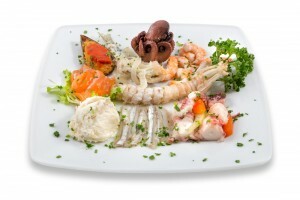 "The Raw seafood is the specialty and you can do one yourself which is a 2 level platter or a couple can do a bigger one. Yes it is expensive, yet it is fresh seafood and it is Venecia and it is real big. And you can top that with a Oyster Martini and stay late at night and hear my music and maybe dance a little in the backroom. It is one of only a couple of places in Venecia where young people and older people of course can have a good time late at night." "Here is the view from my Oyster Bar Riva degli Schiavoni.on the Grand Lagoon. While the prices here are a little bit more expensive than the SESTANTE, it is totally worth it to have such a view!" says Francesca...I think yes you can imagine the little oysters hiding in the lagoon as you eat their little cousins! 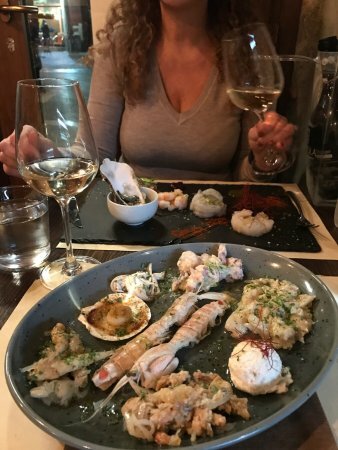 "From the music live every two weeks here open til at least 1.00am to the real raw oyster bar along the Grand Canal to the Rooftop bar, you can have the freshest seafood from the lagoon and world available here, " says Francesca. "And I have a great chef too!" 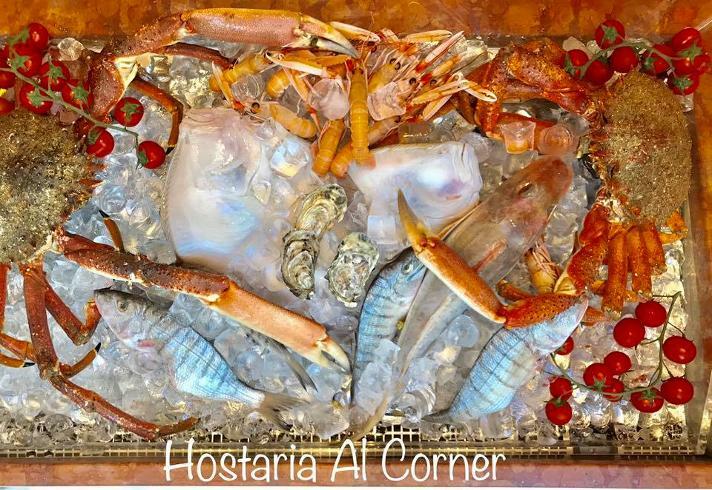 totally cool and very high quality fish restaurant named Hoteria al Corner! on the way to the Rialto Bridge. "I've only been opened here 2 to 3 months and the people love it. We have reservations every night and it is very different from my Bar in Mestre that I have owned the last 4 years named, Victoria Nike." he says laughing all the time as he runs back and forth to his guests and back to the kitchen and back to me today. His cooks are years of experience and the head chef is only 34 years old, yet has been a master chef the last 20 years. They have fish and more fish and did I mention the fish! Location Cannaregio 5604, reservations 041 476 3181.
a mere 65 meters from Santi Apostoli Square over the little bridge on way to Rialto. "The fish from Venecia Lagoon is tiny and sweet...such as the Moeche, Folpeti(baby octopus),Seppie(black squid with black ink), Schie which is baby shrimp on top of polenta, and if you venture to the Mercato Fish near the Rialto Bridge in the morning you see all the Big Couco's and Capos purchasing there along with the local residents. The tourists go there in the afternoon or eat from the Capos!" says Davide. "I am young that is true. However I work hard 4 years and I finally see my dream of making the restaurant of fish here in Venecia. It is the best fish in Venecia. The highest quality and we only have 46 places and of course people have to wait!" "I am Italian of Chinese parents and I want a 100% Italian traditional Venetian Restaurant here in Venecia." says Davide and the Couco shows me the menu which is maybe 14 plates 2nd course fish! "And specialty of the days everyday is the Fish!" says the Couco Ermal. And of course the wine is exquisitely Venetian! 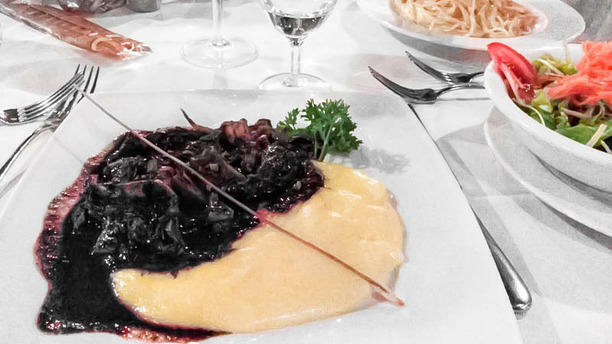 Octopus salad, Seafood Appetizer, and to the real hungry eaters is my favorite, Venetian liver polenta cut of duck with rocket "grana" red wine sauce! "I am a Pesce Chef 20 years now," says Ermal. He shows me the different types if King Crabs in the Venecia Lagoon, laughing as I say is that real? "We don't have the King Crab in the restaurant of course!" he laughs. shown above, which the Tel Aviv Cultural Attache couple sitting with me told me about. "My grandmother, and the traditional people of Israel do not use electricity on Friday night. They bake in the oven the traditional dish that you are having and eat that on Saturday." she says. After I ate it, since they had ordered something different, they then ordered the same plate while I ate dessert. It was A CRAZY LOVELY EXPERIENCE. ..."everyday you can come and experience the underground lobby bar in the cultural room, of the Michelin restaurant of 17 years, have a lovely glass of wine, peruse the Old Poet's guest book of Erza Pond and many others, hear real live musicians on our cultural nights and find a life of only the real literary giants of the world, then enter the Michelin restaurant for a experience of culinary delight you can not find elsewhere in Venecia, " says the Capo, Sergio of the Bistrot de Venise. Alright finally how to find the hidden jewel of Venecia. A. He is funny and serious at the same time...Carlos says as he shakes his head when young teens enter the workshop, "Here they buy my friends's leather masks for 125.00euros. They're youngsters. The Theater people, and I am talking the real theater people talk to each other. They argue discuss and evaluate life. That is the way they do on the theater stage, too. When they come in here, and I am not talking Angelina Jolie, I am talking about the real theater people on the international stage. They want a mask that fits their face, though not necessarily the character of who they truly represent, yet who they want to represent as a character. The masks I make each one is hand-molded with clay and paper mache and fits the face. The one you love and tried on is a Japanese Mask and it's name is Hannia for the jealous spirit of a woman!" he says after I try on the brown clay mask with the white feathered hair around my face made with real soft white feathers (from 30 years I have had these feathers) and white wide teeth in a smile open. When I try it on I become shorter and wider I say and I do a little scary dance. It is cool. "That mask transforms you and becomes alive. It is a spirit mask. 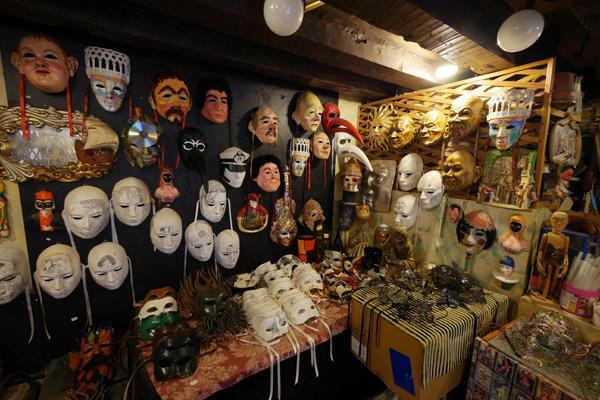 Each mask makes the person come alive in a different way, not themselves." he says. I LOVE IT. Starting at only 250.00 euros he says, "that original mold is made for a Swiss National Theater actress on stage and that one I made for here." he says. I remind him that it has feathers. "Yes yet I use feathers for mustache, for eyebrows, for hair, if you want feathers like this," and he makes funny hands on his head, "like an Indian go somewhere else. I don't make Indians." he says and he is so serious in his dance of a Indian that I start laughing hysterically. where they do real cultural shows he says he would love to . I say that he shall sell all his puppets. that he must make more puppets! I finish I finish. That is how long each mask takes." Okay the Master Mask Maker is a Mask. 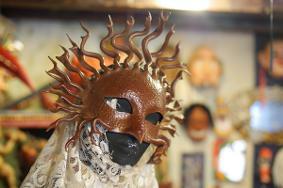 1735 S. Marco and see the coolest sweetest old man ever making puppets & masks. 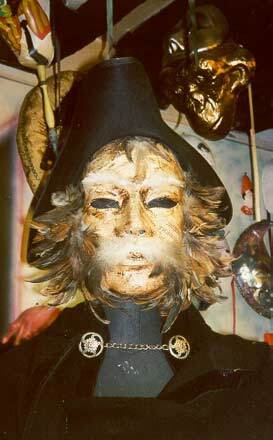 "I make masks the last 48 years. Each one is a inspiration to me. When people ask me which one is the favorite of you...I say that the one I am making right now is the favorite. My friends come in to see me and ask to take a coffee with me all day long. The old timers...we laugh and they say "O Carlos which mask are you making today?" IT is 45 years of work. I used to work with a student of art in Venecia who is in Florence. She draws the art on the masks. The feathers are real bird feathers. 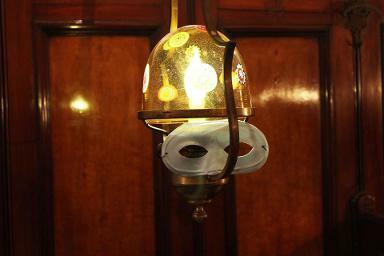 The masks have special productions to each." he says. "See the dolls? They're really puppets...each one is 250Euros and up. THey're all handmade. Each one is alive and special." he says. I say that my cousin Chelsea collects dolls original and she would love love love these. "To experience Venecia one must walk lost around the city. 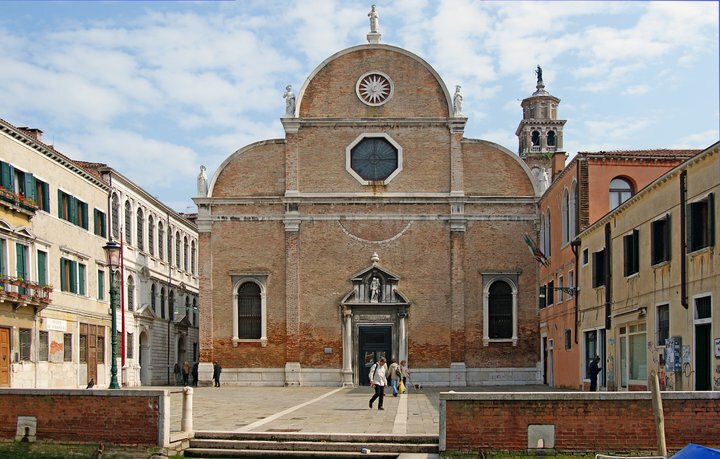 It is only at that time that you will find the real Venetians and the real Artisans." Carlos says. You must visit this guy! He is laughter and affection and charm and TALENT! Think you're little old grandfather in a sweater sitting behind his workshop smoking a pipe! O yes making masterpieces...I forgot about that one! Whenever I ask Carlos who reminds me of Gepetto, do the stars come in and buy dolls? 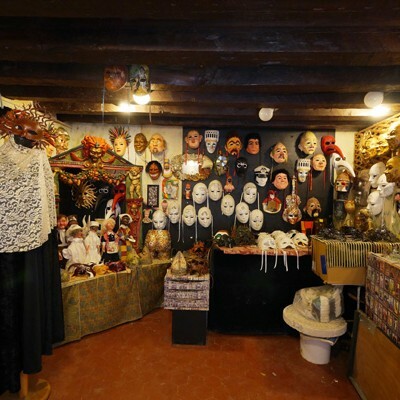 He laughs, "They go from hotel to restaurant...yet they would have much more fun walking with masks around the lost hidden alleys of Venecia to discover the real artisans and the true city." 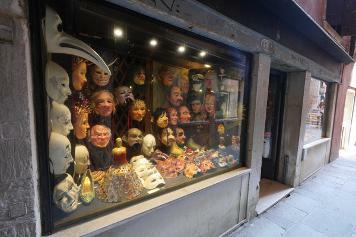 That is true and they should wander around the city and find the fellow and buy these masks! Tradizionali maschere prendono vita nel laboratorio de La Pietra Filosofale, nel sestiere San Marco. La carriera di Carlo Setti inizia da un libro. Proprio dalle pagine di un manuale impara quella che è diventata la sua passione, la sua vita. Dopo anni di attività nel settore del teatro e nel mondo dei burattini, Carlo diventa il continuatore della tradizione, affinando la sua tecnica ed il suo stile nella costruzione di maschere. 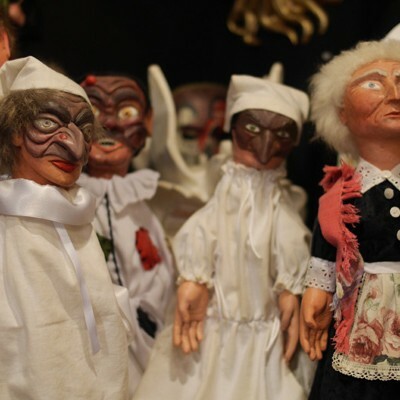 Il cuoio che viene pazientemente scolpito e tutti i materiali sono accuratamente selezionati per far emergere espressioni e tratti di personaggi famosi o della tradizione carnevalesca veneziana. Ogni prodotto viene costruito su misura del viso dell’attore o di chi lo andrà ad indossare, acquisendo una singolare unicità. Alessandro,"Yes it has been 3 years since we met, and instead of my partnering in different cafes and here, now I am only here." he says with enthusiasm and laughter, always smiling. 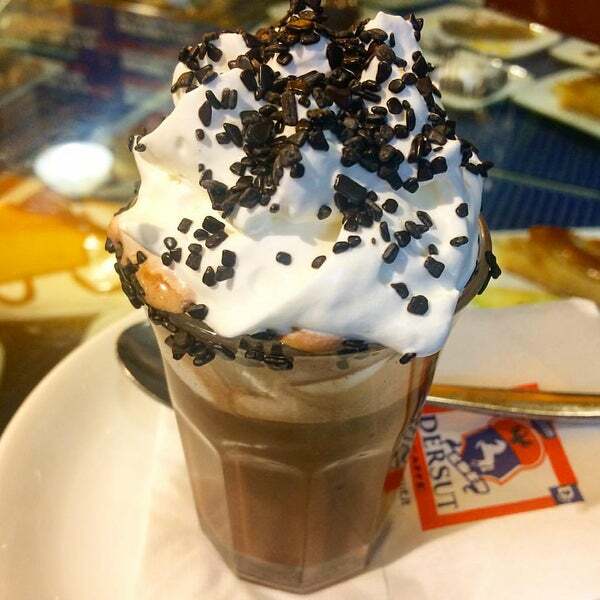 "Here try 3 of my specialty cafes, one is with white cream icecream and hazelnut and the girls love it, that is one I made up myself. The Bottegas by Dersut give us a list of items that we all carry, yet we're allowed to be a little creative and make some up. The other I have you try is the cappuccino and the Cafe Cime which is with green mint and my favorite. I love my job so much now that I sold everything and now only am doing the one I choose now!" "The Venetians come in, the older ones every morning and chat about life, since we open at 6:00am it is fun for me to hear their stories about life. Some of the real Venetians only venture to the espresso, yet weàr trying to coax these to try the speciality ones. The tourists are sued to Starbucks around the world and they always ask about ours such as the Nocciolto and they love these so much that when the day at Venice is finished they come here to have a coffee. We're open til 19.00pm, and trust me yes the specialty coffees are fattening!" he says laughing. It is difficult to believe that the young couple you see here, the Capo, Maurizio and his 30 year Michelin star wife, Mara, have a son who is 40 years old...I had the fun pleasure of speaking with , Damiano Martin, about his legacy and his famous family's restaurant in Venecia. 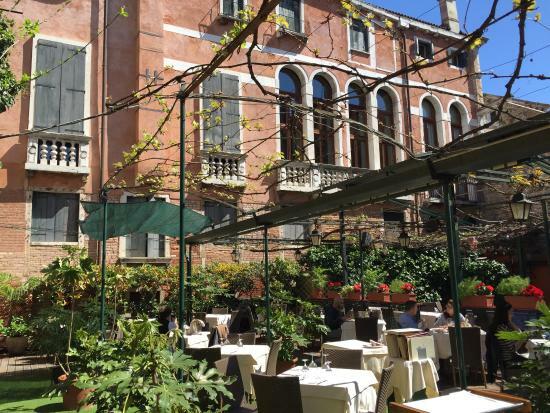 "It is the oldest Michelin star restaurant in Venice and has been awarded a star because of its food!" he says in his serious way. It is funny though because he says it in a way that implies not because of my friendliness, which by the way he is of the utmost professional when it comes to making his guests comfortable. "A couple people come here everyday the last 40 years...one comes to mind from Tuesdays to Fridays and the Venetians are very loyal. Yet we have our share of celebrities such as Anne Hathaway who was here last night and the star of Blacklist. They're both real nice people and of course everybody wants their autographs, yet we give everybody privacy and respect in the restaurant. Once they walk out...." he starts laughing when he says that. "You know people see stars and assume they are like their roles in real life, yet a real stern serious person on the movies could be the nicest person who smiles all the time in his personal life." 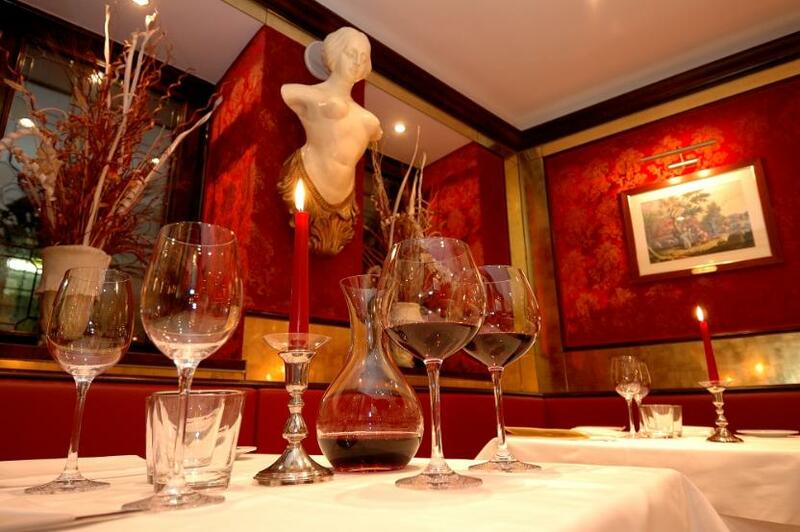 "Fine dining of course since we have been Michelin for 30 years, and at night especially it is beautiful with the Murano glass of sculpture L'ISOLA from the Carlo Moretti showroom in Venice on each table and the romantic table on the terrace. The lights reflect on the glass at night and it is intimate and gorgeous. You must come to dinner at night to see it," he says sincerely. And of course since I become very fat in Italy I say that I would love to do that. "The restaurant opened in April 1, 1976 right here. My father and mother started the restaurant and I try to respect and listen to both. Is it easy and fun to work with family? No! Just kidding. Yet the reason I come to work everyday is that I love my job and I love working with the guests. 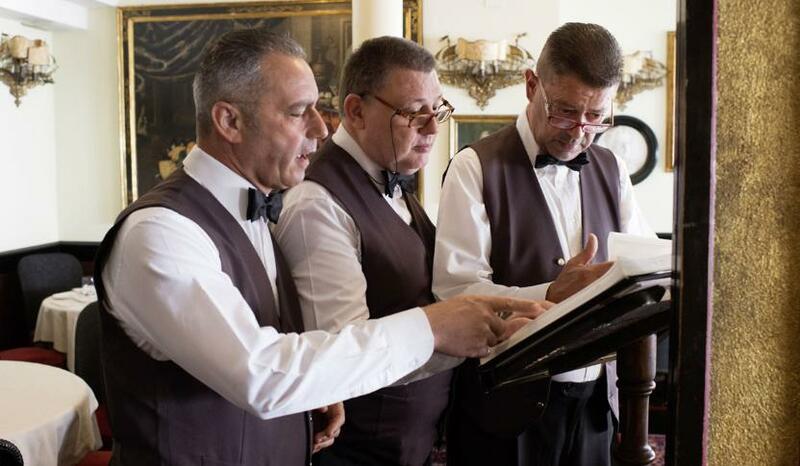 Every guest is different and the young ones are dealt with differently than the older gentleman who always orders a martini and wants in depth information about the city of Venice or the culture or the history. One time a gentleman about 65 said thankyou for suggesting a Cosmopolitan and a Martini instead of assuming I would order the conservative Martini. It has been a long time since someone asked me for something in my younger years, he said to me. That makes me feel good because I found something that interested him and brought back memories that made him happy." he says. have always been very friendly and nice to me." a smile on their faces that they love life." 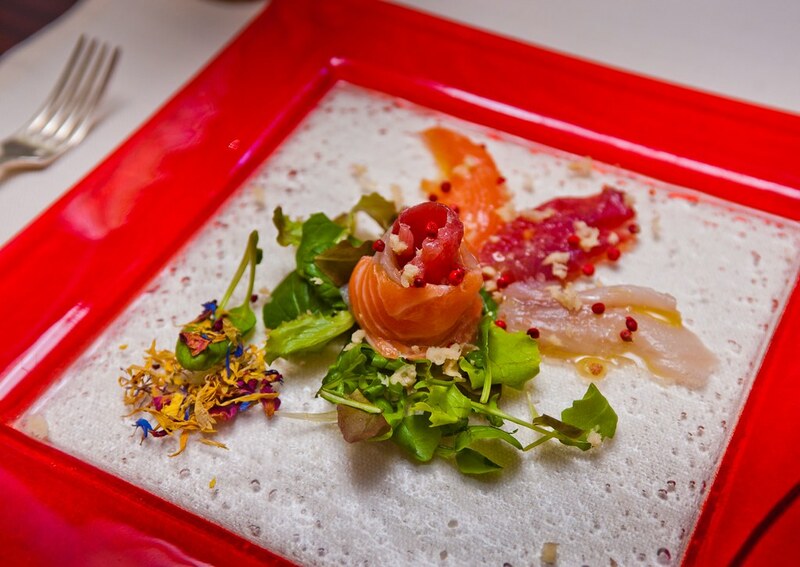 of creative food yet each day different." he says. The Beautiful Elegance of the light Murano glas on the Sophisticated Table of Da Fiore..
"my mother went to the Botanical Gardens and she is smelling the herbs and flowers and she thinks of creations with these...for her it is a feeling that she has with food." Says Damiano who speaks with utmost respect of his mother and father's life work. "With us every dish has a story." the highest quality of seafood and service. I don't like Michelin, and I don't want to be Michelin. me making me laugh and giving me proseco and salmon. My two favorites! Here is the team eating live Mochea which can only be found in April and May and perhaps a little June in the Venecia Lagoon. ! Lagoon..."If I don't eat the Mochea it goes to my tummy and it tickles me!" jokes Mamun. Here is the Maestro! at work! He is a shy, happy person and very proud to show you his restaurant. "Although the owners many years since World War I designed the interior with the yacht's original booths and lamps, which of course we kept." the funny kind capo says. It is a mixture of young and old. Here people can dine in private- downstairs in the Yacht's replica room." he says. "I made 2 years Antinori Vineyard replica room so that the people could drink the wine that I love and to appreciate the atmosphere of the tradition of these noble families." the Capo says of his room decorated with Stain Glass Cathedral windows and the wooden crates of the Antinori family vineyards. It is a beautiful idea to blend the young with the tradition. is from the 1900s, the Grandfather of the famous family since 1397 has been making handblown works of glass of exquisite detail and beauty. "We use water glasses that are only Murano glass and each one is a special color and design." says Andrea. As we walk around the restaurant the boss shows me the glossy walls and the ancient lanterns and the decanters of old whiskeys and grappa sitting on the massive cabinets. You feel transported back into that time and place of real luxury and old-fashioned traditions and manners. It is kind of cool! "The real thing that I try to do is when people walk into the restaurant they feel as if they enter my home. I am friendly and I try to make sure that they feel at home. I don't want them feeling like they're at a restaurant. I want them to feel like at home." he says. 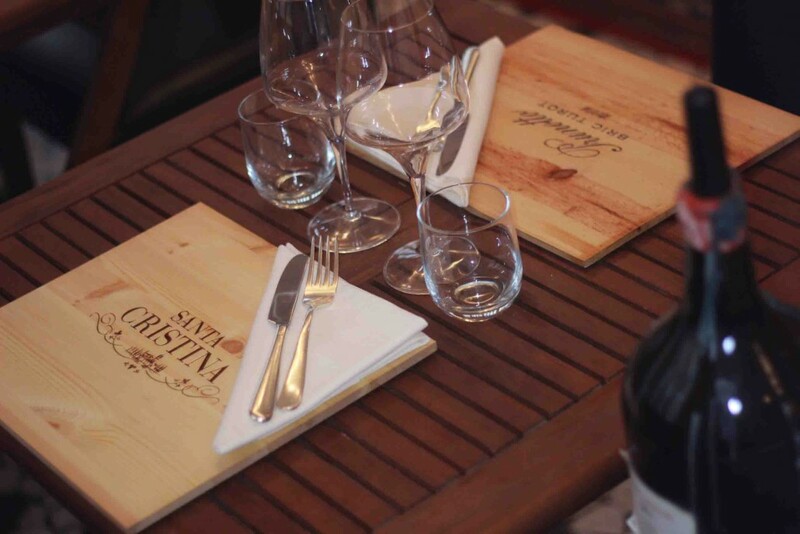 "The wooden tops of the boxes that hold the wine bring the feeling that I want of the restaurant. It is a traditional restaurant steeped in history and I want the atmosphere to reflect that luxury with the friendly team. Luxury doesn't have to be stuffy." 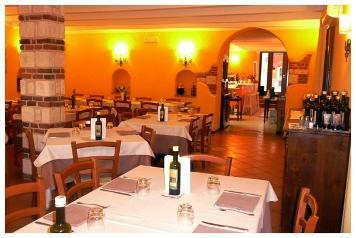 You know the world has many restaurants .Trattoria Da Ignazio is one of these. And one has to say...I work my entire life to come to Venecia, the city of wonder and beauty and mystic. Where should I finally after a long day of seeing the city eat? I am at a city that is famous for its canals and going out to dinner. I know, let's try the 65 year old traditional Garden Restaurant named Ignazio. "The restaurant is named after my father. Truly§? I wanted to be a architect. Actually I received my degree in 1979 and the new renovations of the restaurant I personally designed." says the famous architect named Fiorenzo Scroccaro.His father started the restaurant in 1951 and it is one of the oldest Venetian real traditional family restaurants that still exist. "Now it is my wife and me only. It used to be my mother cooking in the kitchen and now us. I would say that half of the people that come in here to dine are Italians and Venetians and half tourists. That says a lot about the restaurant when the residents eat here!" laughs Fiorenzo. "Golf? Not so much anymore. I am busy now since it is the season of fresh lagoon seafood such as the delicate Mochea, which are my favorite. We are know for the seafood here and I personally go to the Fish Mercato everyday. I enjoy it. I love the restaurant and I love the tradition of my family here. Yes, you remembered the Bocce Ball! It used to be played by the locals everyday in the garden. Now the garden is as important as when the tourists enter they first see the restaurant and say, O how lovely, THEN! they see the garden. O we want to sit in the open garden. 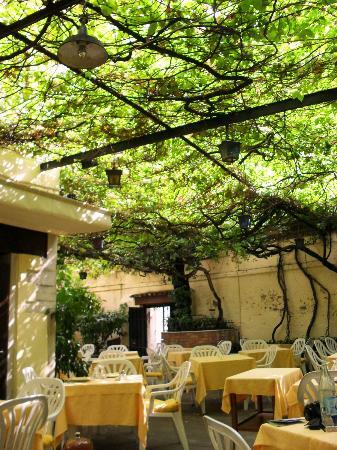 It is a oasis in the center of Venecia and very rare." he says. Above you see the beauty of the Ignazio inside and outside. The Garden used to house a Bocci Ball playing field and can still be seen depicted in the photographs that adorn the walls. "You know it is much harder to be a owner of the restaurant than a architect." says the tall charismatic owner Fiorenzo, who along with his wife, Fiorella, have been the Capos the last 33 years. Above is"my waiter who has been with me for 35 years now. Yes he and I run to the tables. Back and forth. Every day. You know my day starts at 8:00am everyday and at that time I go to the Mercatos and I buy the fish. That is mainly what we are famous for. And that is everyday I hope!" he laughs. "The freshest fish and the best. And I come here and til midnight most days I work. Yet some days I go golfing at Lido. And some days I love to have a day of driving my boat in the lagoon. I guess I do have fun days too." 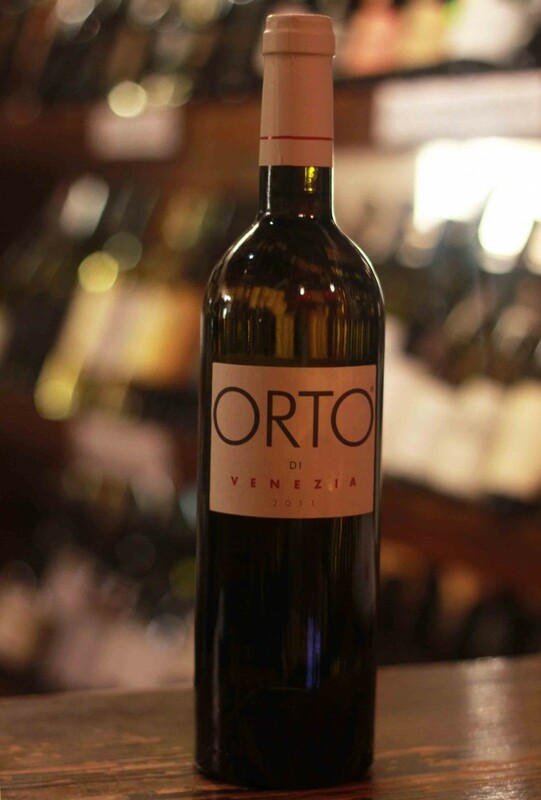 "My Wine is a mixture of Venuto, Piedmont, and Tuscany with a little Sicilian. I have a couple from Champagne area of France of course, and my restaurant is known for its Beef, too. It is a little bit expensive as it is a real authentic highest quality and always catch of the day seafood that we serve. And I would love to say that they come back everyday because of me since I personally wait on the tables myself. I enjoy the people and the way they enjoy the food. When the guest is happy it makes me happy and my day fun." says Fiorenzo. 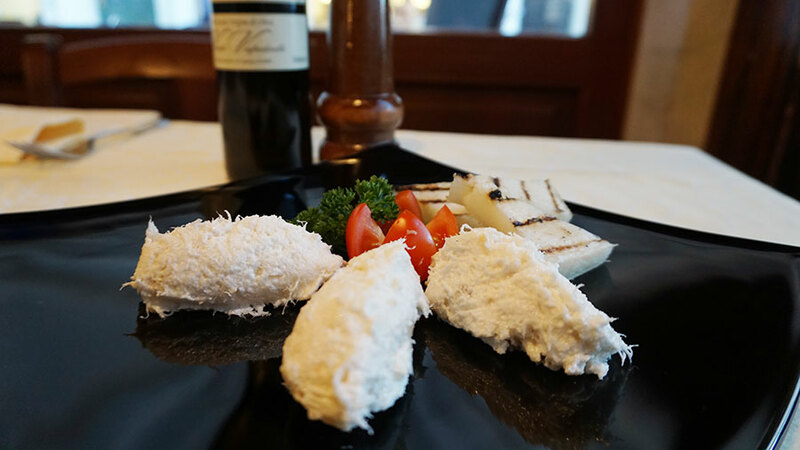 "I guess what I would love to say is that the specialty of the restaurant is fresh fish and that is the freshest everyday. If my best friends come here I give the Sea Bass and the dish of the day and that is most probably the fish." he says. At Ignazio, where "actualy it is named after my father...that is his name. And when he first started the restaurant in 1951, in the walled garden is where the locals played cards on the tables...drinking the wine. In the back of the garden is where they played Bocci Ball!" says the owner, Fiorenze, whose wife is Fiorella. "We are both called Flowers. Yet in the Garden is only Green." he says. "I have been here 15 years. I learned seriously when my father took me under his wing...yet I learned the most just watching. Learning and observing. I watched my father. I much rather be an example of him. His life. I am proud of what he has done here. He started with a small restaurant and has built it since 1973 to what it is today." says Diego. "It is very hard to receive respect from somebody that you admire. At least the perception is that. It is difficult to work with my father since I want his approval in the way that I present myself and he is a perfectionist." "one time," says Pasquale, the waiter that has been here 34 to 35 years..."a lady loved animals. She came here and saw the lobster on the fish ice. She said, Can I take that lobster back with me? I am buying that lobster and I would love to add it to the bath and save it. Sometimes people do try to save the lobsters." Diego above says, "here is a famous football star. We have movie stars and famous people that come here mostly since it is beautiful, private, luxurious and has the best food. 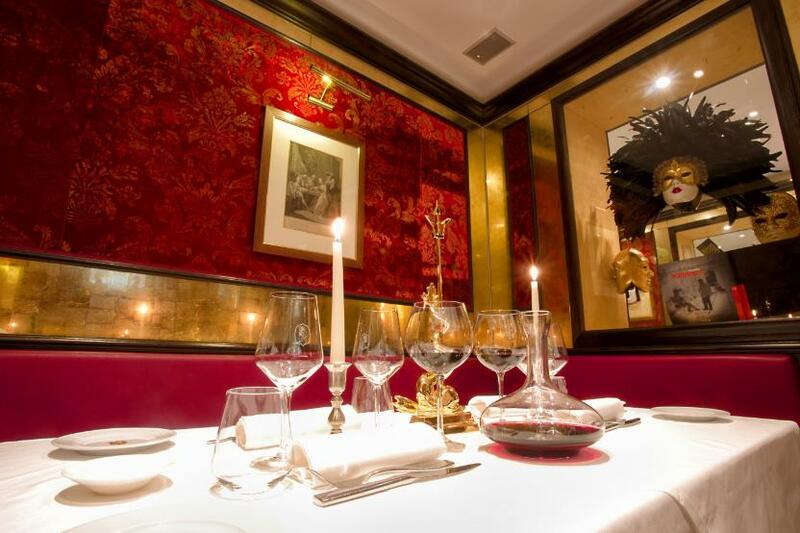 "People love the fireplace room here since it is elegant yet lively full of people every night. You know they can have fun. The room next to it is the Garden but it isn't a real garden it is only a garden room with the authentic floors and the overheard covering. 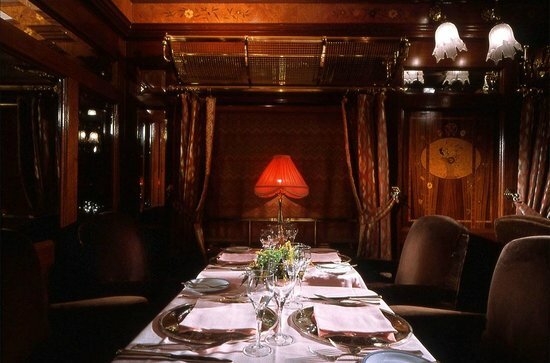 IT is more fun to work in those two rooms honestly instead of the more private rooms of the Orient Express. " says Diego. He shows me the Orient Express rooms which have a playful atmosphere to it...complete with luggage racks overhead! I love wealth and champagne and caviar and luxury the most when people who have all of that take the day to sit and laugh and relax and share their vision of life with you. Here you will find only warmth and affection and laughter. That is Do Forni! It is elegance, class, formality, luxury..."we have the orient express room... you know my father has the most unique restaurant in Venice...in between the two rooms is that public alley. And when my father needed a new room to add to the restaurant he bought the one across the hall. Here it is romantic and private and elegant in the orient express room and across the alley is the garden and fireplace room where you can have fun. That side is fun." Diego quips. I think...hmmm romance must be dull and fun is fun! 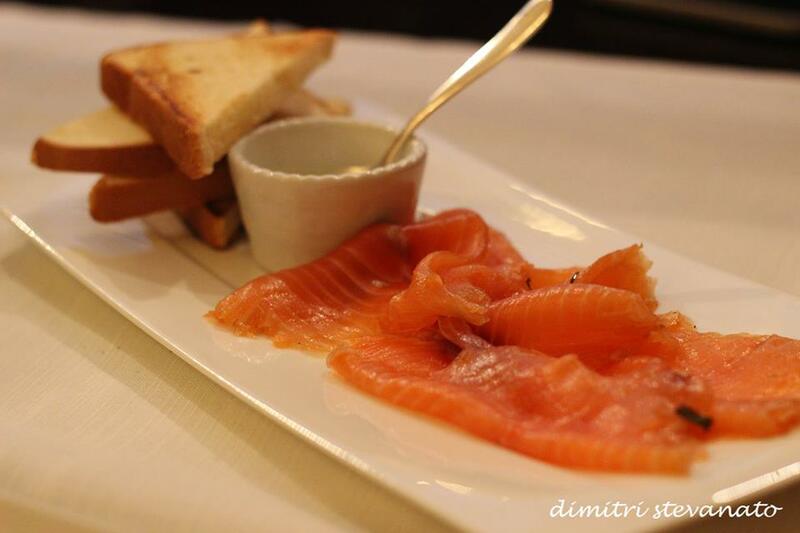 "WE have lobster and caviar and the better champagne yes, however we have the highest service with friendly staff. We wear tuxedos but we're not stuffy you know. People can come here and relax. People come the first day at Venecia and they come the next day again. That is cool. Venecia is cool. I don't even own a car or a boat. I know many people that own boats but most of the real Venetians take public transportation. Would I love to live anywhere else-no" says the young funny yet serious son of the prestigious owner of Do Forni...think Maxims of New York. "I guess the Michelin is more into French copy restaurants nowadays," says Diego, "I want the best service with the highest quality. The Orient Express Room is real Orient Express and I know you love that room; however, when the people enter the front they first see the Elegant Burgandy Velvet Cigar Lounge, then we take the guests to the Orient Express and finally opposite the alley in between the restaurant to the elegant hunting lodge. They ooo and aaa and pleasantly surprised at the rooms. They love the Backroom." he says. Calle degli Specchieri-San Marco. "You know here at Dai do Cancari Vineria I have cool guests, friendly guests, talkative guests, shy guests and Movie Stars!" says Marco as we chat about the wine store that I have visited and wooed for the last 3 years. He is so famous he never goes into my guide, yet now he is! "When they filmed the Tourists, Johnny Depp, Angelina Jolie and Brad Pitt came in here everynight and they would say, close the door Marco, we don't want the cameras! And I would close the door and we would drink a couple of bottles of wine and chat. Brad Pitt is very kind and the other two a little wild.! The father of Angelina Jolie, is the nicest and her mom is too. They were a lot of fun and stayed here 3 months!" he says. I tell him the next time they come in tell them I have a great movie script named "the life of Albert" for them to produce and star in and direct. He says he shall! We all love wine, right? Especially when in Italy we want to learn and appreciate the luxury of the Italian culture...come to say hi to Marco at the lovely Dai Do Cancari in Campo Santo Stefano where the amazing man is open from around 10:00ish am to midnight everynight. "You know some people from around the world come here and they ask kindly to try a bottle of wine that is very expensive, say 430.00euros a bottle. If it is just me and the private group I open the bottle myself and ask if they would love a taste. They always end up buying a bottle or two. After all most people that ask if they can make sure that they will enjoy the 400.00 to 600.00 euro bottle can afford it. However, for example, if a couple come in and ask if they can taste a bottle that is 13.00 euros I say to buy it! I mean it is wine. The worst that can happen is you drink a little too much wine! Yet the wine in my store is all of excellent quality. It is my store and I only pick and choose since 2006 the best wine. I loved that year and I bought the store. I made it mine. I love my life, my wine, my family, my daughter. The surprises in my life, how do you say? fate? They made me who I am. The ups and downs of my life. The extreme sadness and the extreme happiness. As a young boy about 20 years, I went to New York with a plane ticket and 500.00 euros from my father. My best friend who had blonde hair and blue eyes and me with green eyes and blonde hair(I am bald now you see! ), went to New York. I had been a model in Milan and knew I could see the world. My father said, when the money is gone it is gone and you will be back soon and I said, "no papa I will not be back.". He said, we shall see. One year later I came back! " says Marco. "I met a big jolly sicilian woman who hired the both of us. The first thing I did is fire the Mexican cook. He didn't even know how to cook spaghetti without using ketchup. In two months we turned the Italian restaurant around to making tons of money and a lot of people. After one year they begged me to stay yet I said, "I am young and want to see the world." I lived in Asia and I lived in Australia for 3.1/2 years as a male dancer. It was wild. Met a young girl fell in love and stayed 3 years. Now I am married to a wonderful Italian/Armenian woman and we adopted a young Armenian daughter who we love. She is now 7. My life is beautiful now. And yes I would say that I am a expert on wine in my store!" he says. my life and I love my life... "
the names of the wine, the address where to have it sent, the credit card number, the phone where fedex can reach you! easy as that ciao and happy wine selection! 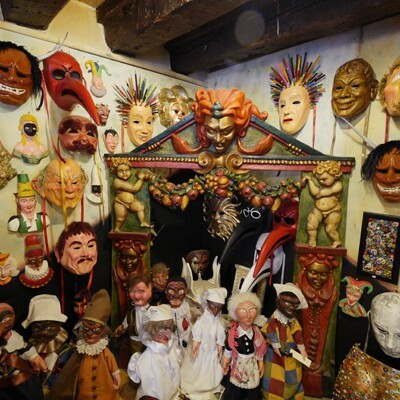 Here is the real artisans of Venecia..."Yes the Doge comes in the Carnival people, I have my masks in Switzerland Theater and France and England and Australian and America and they have a special masks. The woman of 20 years ago came in here and said O I bought a mask from you 20 years ago and do you remember me! The people walk through the alleys of Venecia to find us. There are only 20 of the Mask Making originals left in Venecia and I hope they find us." says the kindly old man...think Picasso and Rembrandt and Shakespeare and Beethoven...wouldn't you rather meet these people when they're alive? 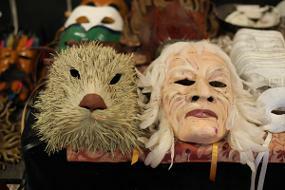 "I make masks the last 45 years. Each one is a inspiration to me. When people ask me which one is the favorite of you...I say that the one I am making right now is the favorite. My friends come in to see me and ask to take a coffee with me all day long. The old timers...we laugh and they say "O Carlos which mask are you making today?" IT is 45 years of work. I used to work with a student of art in Venecia who is in Florence. She draws the art on the masks. The feathers are real bird feathers. 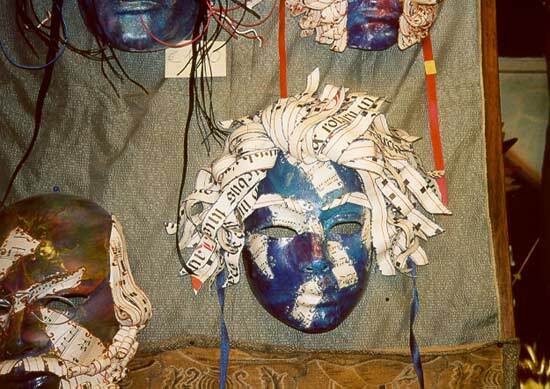 The masks have special productions to each." he says. "The White House has the pattern and fabric here,"he says as he shows me the pattern the White House ordered from the store,"And the Kremlin has our fabric in its mansions...many many famous people yet to protect the privacy I can only say these two." Famous musicians...like Mick Jagger? "No comment." he says. "We have about 25 antique looms from 300 years old. They are the only ones in the world. Every couple of months we're repairing one of em!" 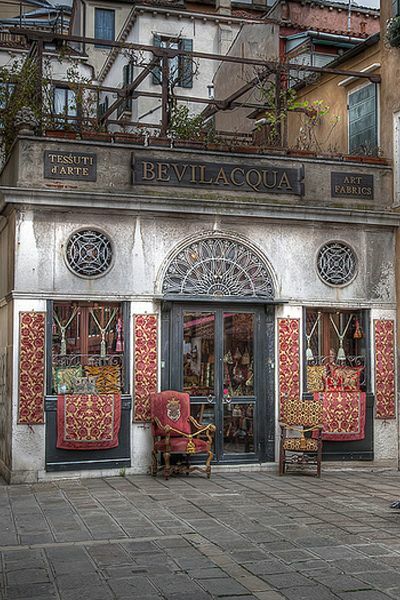 says Gianluca, the son of one of the generations of the famous Bevilaqua family in Venecia. "The only way that you can have fabric the way my family has weaved it the last 300 years is on one of our looms. There is no other looms in the world. Of course there is modern day ones, but we have the original one. It takes us 2 to 3 months to set up the loom and at that point you can weave 40 meters of fabric. After that you have to set the loom up again. And if a new weaver takes over the making of that pattern I can tell the difference. It is slight and others would have a hard time telling the difference yet I can tell between these. I've known all of the weavers my entire life." he says. "See the delicate fabric and design?" he says as he shows me each beautiful piece in the store. 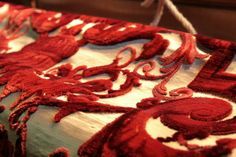 "It is Soprarizzo uncut velvet, the best production in the world. You can not get antique loom stills that make these anywhere else in the world. That is why people come here. I myself have Mariano Fortuny that was a painer and artist in the 1900s yet he was a competitor but we use the velvet silk and the heavy fabrics and we replicate his patterns. 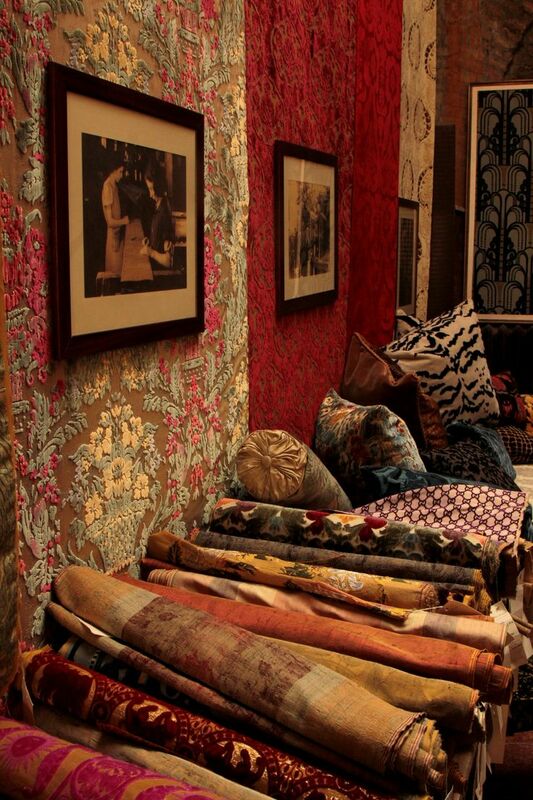 I love the antique fabric and the place where we work. The factory with the looms is about 500 square meters. IT is pretty cool in that place. I work with the interior designers and help these professionals to choose the fabrics. I love my job." he says. "I have a boutique specialty wine store next door with cheeses and salamis and fresh sauce that the cooks make here and the guests can purchase and take with them!" says Davide as he shows me the cool caverns of about 500 years old! 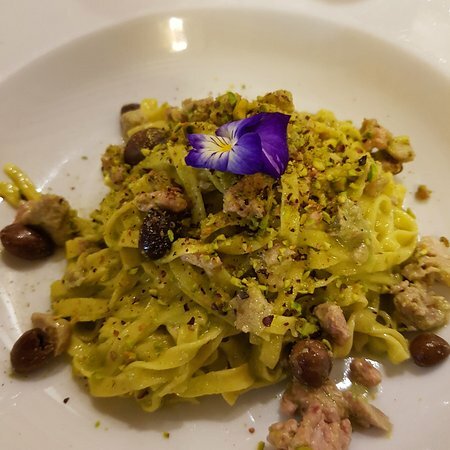 "It is named Bottega dell'Osteria and has such delicacies as bottled pears and kiwis...all from local farmers...as a matter of fact 100% of the food is within zero kilometers...grown near Verona." he says. 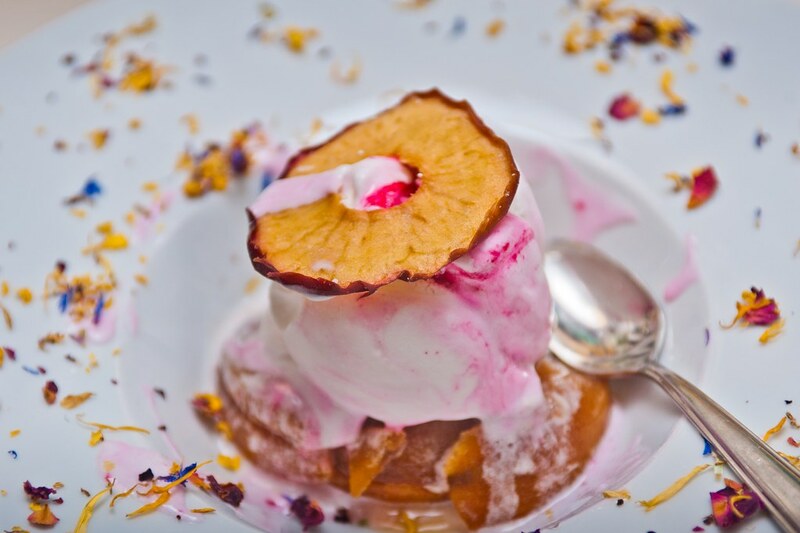 "I opened the restaurant since for me food and especially the food of Verona is about tradition. I wanted people to know the culture and the territory of the food. How it is grown and how it is served. Where the products come from. The guests that come here are curious. They ask where the plate is from. They want to know about the Italian culture and about Italians. I am happy to talk to the guests about that. I am happy that they want to know." he says. The interview with Davide took about 3 visits...the last one being at 22:00pm at night on the 5th. We had such fun perusing the website to find the perfect pictures to showcase the restaurant...when he insisted on showing the Horse Tartar I objected. "The Americans are squeamish, yet the Horse meat is reverred by many Europeans and the people from China. 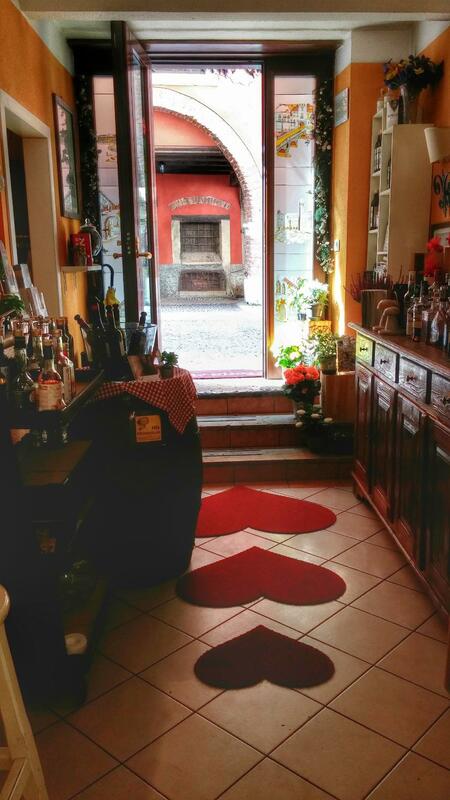 I would love to show the famous G nocchis that the restaurant is known for too, and of course the Valentines entrance...the city is after all, the most romantic city in the world with Romeo and Juliet!" he says. "See the Goldfish?" he says as we stand near the wine bar talking and I notice two big goldfish in a aquarium. "These goldfish I bought 4 years ago. I kept them in a Goto shot glass and changed to tanks and 4 years later it is the third tank. They keep getting bigger. I used to have a dog and cat and a horse and the goldfish but now only the goldfish." he says laughing. 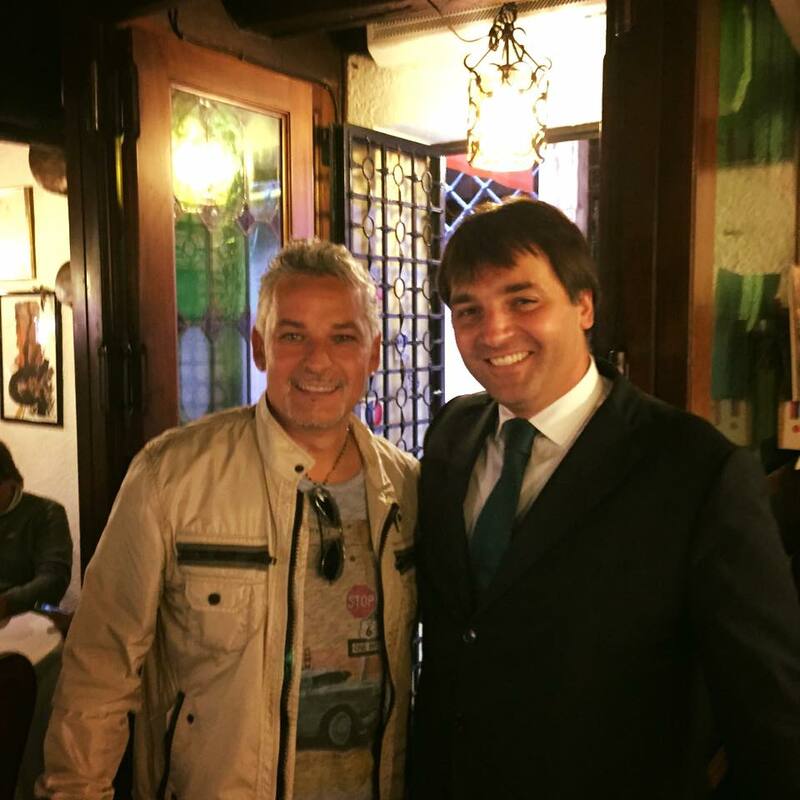 He is pretty easy to talk to...sincere, nice and happy to talk about his Very Verona Traditional Osteria. Davide offers me a GOTO which is the typical shot glass of wine that the people of Verona traditionally drink. "We, when my friends and I go out for fun we drink the Superior and Classical Gotos. That is the way it is usually given. The more expensive wine when you go out with friends for a casual night nobody wants to buy the expensive stuff. We like to sit and talk and drink the GOTOs!" he says. I tell him that the Superior he lets me taste is excellent and that drinking the shots of wine named GOTO is totally new for me! BELOW HORSE TARTAR! I run into the Osteria Al Carmini last night about 21:00pm and ask if it is a good restaurant...I mean a real traditional and great food. I had just met some American friends about 125 meters away on the same Piazza at the famous "ORANGE BAR" and they had complained about their dinner the night before. "YES of course it is the best. I am the chef," laughs the young owner of the tiny boutique Osteria. "Only two of us work here. Me the Chef and Valentino the waiter. It is my restaurant and I used to work in the famous restaurants in the city such as at the MONACO Hotel in the famous kitchen and I finally got to open my own. 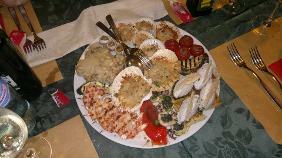 I love to come to each table myself and talk to the guests and suggest a fish plate. Since that is my speciatly I love to ask each guest what they like and they like the fact that I am the chef and I care about each one." He says. I tell him the interview must be fast since I have to run back to the Orange Bar and grab my friends before they go some other place and have a worse dinner! 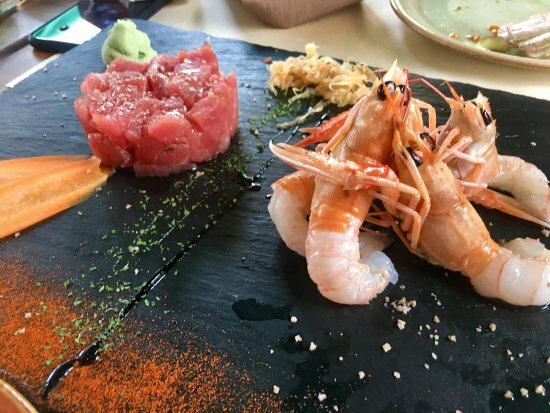 "The plate here is all fresh fish, me and Valentino go to the fish mercato every morning the earliest we can and buy the best fish. They keep the best for us hidden away from the tourists. And I named the plate for the Doge...it is actually named after the Doge's boat similiar to a Gondola yet more Royal and Important. The plate is named the Dogeressa and is big enough for 2 people. That is my specialty here...the fish." says the laughing Chef/owner named Danieli of Al Carmini in the famous University area. They laugh and hurry to show me the kitchen and the fun music they play and they act like excited little kids. I had the best time in 12 minutes during a interview I've ever had. Loved them. Trusted them and knew that they would cook you the best dinner with love and care. Yes here is the tables, see the iron balconys? "yes people ask every day...can we do weddings here," says the 60 year old owner of the 1300year old Sempione on the canal...right across from the balconys about 10 meters is the other side of brick arches and to the left and right little tiny bridges...perfect for weddings..."I tell everybody that it is impossible to tell my reservations that I must close the restaurant to do a wedding right now," just then the Gondolas honk their horns as they glide on the water near the balconys. "Yes funny...the Gondola drivers come in here everyday to eat. I know every Gondola driver. And see the flags on the wall? That is the winner's trophys from the 2013 Gondola races, which by the way the Regatta is Sunday, September 6, 2015...right here in Venice. "All the important drivers drive the boats, the young children first, then the ladys, the Gondolas are third, and the 4th is 2 person boats rowing or 6 person boats. It is a major event an important for everybody." Luigi says. When I ask, "is the regatta racing the winners the fastest or the prettiest?" He laughs. "Okay, Emily the regatta is the fastest. That is why they call it the regatta." "O," I say, "I thought the winner is the prettiest." make reservations and do a wedding surprise. reservation." he laughs. Hmm...wedding guests! at the age of 10 I didn't want to work at a restaurant.